The Cloudbridge was conceived as a non-linear connection between mountains. We have in mind Himalayan Landscape, Alps and Andes. We tried to merge computational techniques with a visionary and provocative approach which considers architecture as a part of natural landscape. The path between two points, located on opposite sides is drawn in order to provide an exciting experience, suspended between sky and mountain; a specific algorithm computes a cloud-shape grid which bears and balances the asymmetric loads of the footbridge. The structure is made up of small white steel beams joined together in a cubic modular frame; really easy to engineer and build. 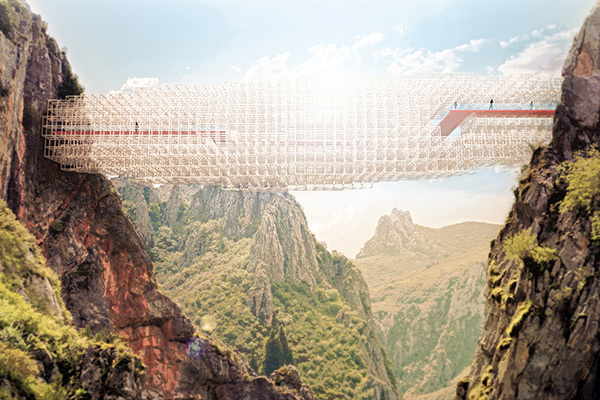 Cloudbridge is an attempt to imagine a new way to design a bridge, a visionary and playful manifesto which invites to explore new trajectories in architecture, rethinking the way we conceive buildings. a>t arturo tedeschi architecture and computational design (mormanno – cs). arturo tedeschi (castrovillari – cs, 1979), maurizio arturo degni (avezzano – aq, 1984).